Kim, Kim, Kim. Why are you trying to ruin my Thanksgiving? In the New York Times Food section last week, the otherwise awesome Kim Severson wrote that turkey brining is passe. She quoted a handful of chefs and writers who are “so over it.” Frankly, they all sounded like turkey haters to me. Kim came too late to food writing to remember this, but turkey brining was not introduced to the public in 1999 by Alton Brown on the Food Network, as she claims. The year was 1996, and the seminal event was a gala pre-Thanksgiving dinner for a group of food writers at the historic Stag’s Leap Winery in California’s Napa Valley. 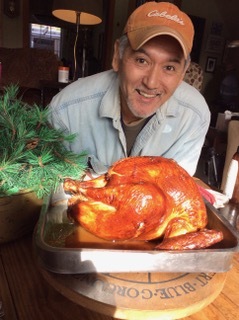 I was there, and was among the many who that year printed winery chef Jeffrey Starr’s recipe for orange marinated brined smoked turkey. That bird was a revelation. It was and remains the best turkey I’ve ever eaten, and I still make a version of it almost every year. No, the meat does not taste “watery.” No, the texture is not like “lunch meat.” And no, we did not start brining way back then because low-quality frozen turkeys were the only ones available. We had already discovered fresh heirloom turkeys in a big way. We brined for the same reason most of us still do: Brined turkey (and chicken and pork) is juicy and tastes great. Dry brining, I’ll admit, works OK, too. But I love wet brining. I am so not over it. Kim cites food sleuths who prepared turkey several ways and compared the results. Dry-brining was preferred in a blind taste test. I, too, have prepared turkey several ways and compared results, although dry-brining was not included. My hands-down favorite method is brined turkey smoke-roasted on a covered grill. No, turkey brining is not dead, no matter what millions of people read in the New York TImes last week. I think the method still produces the juiciest, most flavorful turkey, and I will brine a turkey this week as I always do. My recipe has changed a bit over the years. I don’t use as much salt now — one-half cup per gallon of liquid is plenty, according to the Morton Salt folks. I don’t brine for days, either. Overnight, I’ve found, will do it. I usually don’t add wine, juice and herbs, either. They don’t penetrate the skin enough to flavor the meat, as Kim pointed out in her article. But yes, I will brine. It’s not too late for you to brine, either. If you have a stock pot big enough to hold your turkey on end and is small enough to fit in your refrigerator, use that. If not, use a leak-proof plastic food bag or even a spanking-clean cooler. Mix two gallons of water with one cup of salt and pour over the bird. Add more water if needed to completely cover the turkey. Chill (add ice if using a cooler) overnight. Rinse the turkey inside and out and pat dry before roasting. Build a large charcoal fire (about 30 briquettes) in the bottom of one side a lidded grill, and place a 9-by-12-inch foil pan in the bottom of the other half. Remove turkey from brine and pat dry. Rub or spray the unstuffed turkey all over with oil or butter. Place on the grill over the pan. Close lid, leaving vents wide open. Grill for 2 to 3 hours for a 10 to 18-pound turkey. Note that the air temperature and wind can lengthen cooking time. While roasting, add 6 to 8 charcoal briquettes every 45 minutes, and turn turkey quickly at the same time to rotate the side closest to the coals. Otherwise, do not open lid or heat will escape. Cook turkey until an instant-read thermometer inserted in the thickest part of the thigh registers 175 to180 degrees. Preheat oven to 475 degrees. Remove giblets and neck from turkey cavities and wash the bird inside and out under cool running water. Pat dry. Or use a brined bird. Remove any pads of fat from the edge of the body cavity. Insert a meat thermometer at an angle into the thickest part of the breast, touching the breast bone. Lightly oil the skin all over. Place a wire rack in a large, shallow roasting pan. Place the turkey on the rack, breast side up. The turkey must not hang outside the pan. Pour about 1/2 inch of water into the pan. Place on a rack in the lower third of the oven and roast uncovered until the thermometer registers 160 degrees — about 1 3/4 hours for an 18-pound turkey or 2 hours for a 22-pound turkey. If the turkey weighs less than 18 pounds, check the temperature after an hour. If the turkey begins to brown too much, tent loosely with foil. Pan-grilled filet mignon, fried potato cakes, roasted Brussels sprouts with caramelized apple dressing; ginger cookies with lemon drizzle; potato and greens soup; cubed Spam and black beans in Coney sauce (yuck). Yaki soba chicken at Kasai in Wadsworth; chicken pot pie from Giant Eagle’s deli; Korean pork belly taco and an al pastor (chicken and pineapple) taco from Funky Truckeria in Norton; egg and shrimp bites, won ton soup, spicy prawns, Peking duck in pancakes and egg tarts for dim sum at Li Wah in Cleveland. The Mailbag will be replaced this week with a couple of recipes that I think would taste good at Thanksgiving dinner, along with directions for killer pie crust. Happy holidays, friends. Cover and chill salad. Toss again before serving. Makes 4 to 6 servings. Note: Pomegranate arils may be substituted for the blood oranges. Rinse and dry the beans and trim off both ends. Place a large skillet over medium heat. Pour in the oil and toss in the garlic. Cook 4 to 5 minutes, until garlic has just lightly colored. Put beans in the pan and shake to spread them out. Pour in 1/4 cup water. Cover, lower heat and cook for about 15 minutes, shaking pan occasionally, until the beans are tender to the bite and lightly caramelized. Salt beans lightly. Raise the heat and drop bits of cheese into the beans. Cook uncovered, tossing and stirring with a spatula or tongs while the cheese melts, about 1 1/2 minutes. Spoon into a bowl and serve immediately. Makes 6 to 8 servings. Working quickly so the heat from your hands does not melt the fat, gather the mixture into a ball. Do not knead. Divide in half and flatten each ball slightly. Wrap in plastic wrap and chill an hour or more if possible. Remove from refrigerator and warm to cool room temperature, until dough is pliable enough to roll. Flour each disk and place on a floured surface or between two pieces of plastic wrap. Roll each disk with rolling pin in strokes from the center to the edges to form a 9- or 10-inch circle. After dough is fitted into pie pan and crimped or filled, bake immediately. Unfilled pie shells may be wrapped in plastic wrap and refrigerated for baking later. Makes enough for 2 pie shells or 1 double-crust pie.